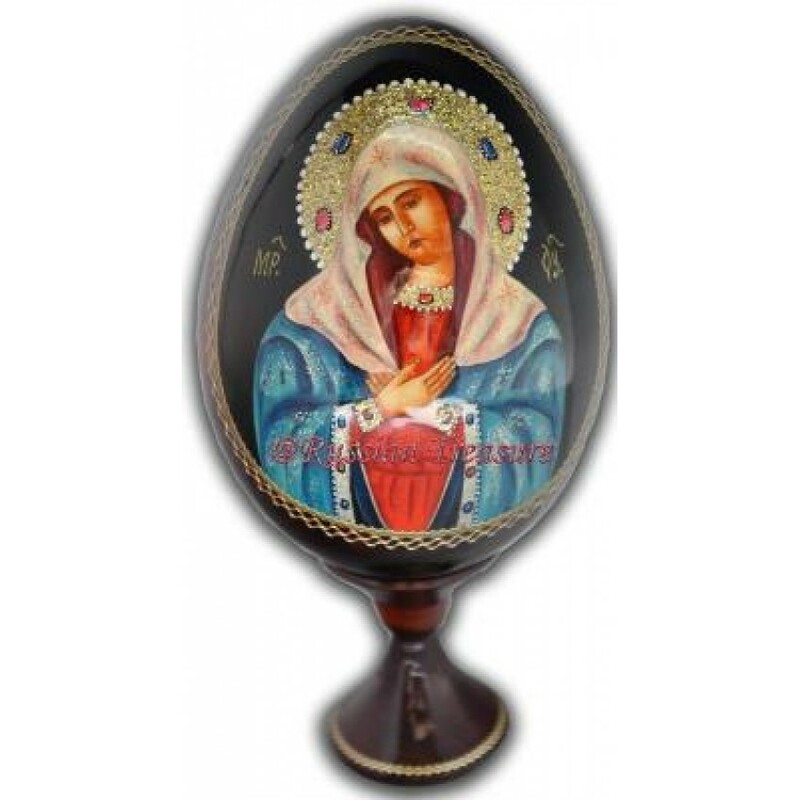 This wooden Easter egg features one of the most sacred Russian Orthodox Icons – Virgin Mary, Mother of Jesus. The image of Virgin Mary is generally considered to be the holiest and most revered symbol of Christian faith. The wooden Easter Egg is hand crafted and painted by a famous Russian artist Evgeniev, who specializes in creating religious images and portraits of Saints. The image of Virgin Mary is carefully painted to the tiniest detail against a perfectly black background. The rich colors of her garments, especially the sparkling blue of her cloak enthralls the eye of the viewer. The artist used silver and golden power, adding it into the paint to achieve the celestial radiance of the cobalt blue. The red of Virgin Mary’s dress – a symbol of her heavenly nature, reminds also of her son’s death for the sake of all human beings. The implementation of gold metal leaf in order to reproduce the halo makes this wooden Easter egg glisten with glorious light. And the sapphire and ruby ornaments add the final touch to the holy image of Mother of Jesus. Rimmed with a wonderful golden pattern, this wooden Easter egg will make a most precious Easter of Christmas gift, as well as become a perfect sign of attention on any religious occasion.